Why Is My Dog Shedding in the Middle of Winter? 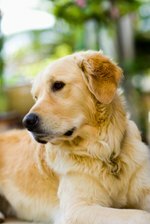 Dogs typically shed the most during spring and fall, though in reality, all dogs shed all the time. Shedding is not an abnormal behavior, but rather, a natural way for a dog to get rid of old, dead hair and replace it with new growth. Excessive shedding that takes place outside of season could be due to a simple climate change or it could be a sign of an underlying medical condition. Regular brushing can cut down on shedding. If you vacation in a hot location or move to a different climate, particularly a warmer location, your dog will adjust to his new surroundings through shedding. This is not typically a cause for concern. The same thing can occur if you bring an outside dog indoors in the winter and his body adjusts to the change in temperature. Some dogs begin to shed excessively if they're stressed. A change in schedule, the illness of a person in the household or the addition or absence of a housemate or pet can have an emotional impact on your dog. In addition to excess shedding, your dog might show other symptoms if he's anxious, such as eliminating in inappropriate places, eating more or less than usual, whining or crying or even being destructive. Show your dog extra attention and work to maintain a regular schedule for exercise and feeding. Create a quiet place where your dog can go for solitude, such as a kennel in a low traffic area of the house, to help reduce stress levels. Unusual shedding can be an indication of parasites, skin allergies, fungal or bacterial infections or contact with toxic substances. Excess shedding can be an indication of thyroid, kidney or liver disease or an immune system disorder. It also can be a hormonal issue, with females shedding more after a heat cycle. See your vet if your dog is losing hair in patches, which could be a sign of mange or ringworm, or if he has open sore spots or a severe skin irritation. Your vet will take a skin culture and conduct a physical exam to determine the underlying cause of the problem and treat it accordingly. Keep your dog well-brushed and groomed and ask your vet about adding an essential oil to his diet to help maintain a healthy coat and skin, particularly during transitional weather periods. Make sure his diet is well-balanced and that he always has access to fresh water. Dehydration can make hair loose and result in excess shedding.